Thor’s assistant points out in the comments that the initial effort at renaming the bridge was announced here on San Diego Rostra by Rostra blogger Vince Vasquez. Seemed only appropriate to give him credit in the body of the article. /update. So what do you think? At first, I was pretty miffed and it seemed like a typical leftist reaction to the greatness of Reagan. But I also thought, in 1987, San Diego voters voted to restore Market Street to its original name after a short spell as Martin Luther King Way. I’m also still miffed about the Murph being renamed after a local firm beginning with the letter Q. Is this issue so different? Contrariwise, its only a bridge, not a piece of San Diego history, the way Market Street was. And supposedly serious coin, to the tune of $18 million, changed hands to get the name of Jack Murphy Stadium changed. What do you think? Please vote in my poll at The Liberator Today. I’m a friend of David, I don’t think he intended to become the spokesman for this effort, knowing David – this erupted from coffee shop banter, to a news interview looking for an opposing perspective and an effort was born. Don’t expect much out of his campaign, its likely little more than debate for the sake of debating it, rather than renaming the bridge because a handful of folks conjured up the idea. In the name of discourse, entertain the opposition, but whats going to happen will happen. As I recall, a few years ago, Dave Rickards of DSC (Dave,Shelly and Chainsaw) sent a check to Caltrans with the memo that this check was for the purchase of the Coronado Bridge, which Caltrans cashed. So you might need to get approval from Dave Rickards for changing the name of the bridge since he owns it and it is “Dave’s Bridge’s”. As DSC has moved to another station, everything that Rickards owned at KGB stayed with Clear Channel, including even the charity fund set up by DSC. So, it would seem that approval would need to come from Clear Channel, since they now own the bridge, along with a lot of other things in San Diego. The morning that the renaming proposal article appeared in the UT, Rickards talked about it on the radio. He claims it’s still his bridge! If Dave used his personal check and not a check from DSC, then it is still his bridge. Good for Mr. Klowden! I’ve already signed that anti-renaming petition and I hope more do soon too. It gives me great hope for this city that the Facebook page for the “no” effort is already bigger in one day than the “yes” page has been in 10 with ample press coverage. Don’t get me wrong, Mr. Reagan was a good president. 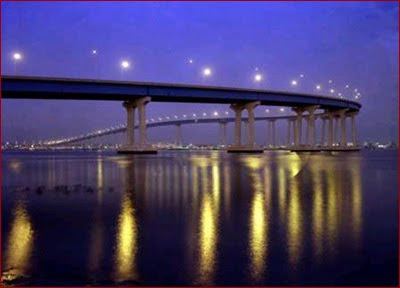 But his ties to San Diego were tenuous at best and his contributions to the building of the Coronado Bridge were nada. If you want to honor the man find another way. Do not rename a long time San Diego/Coronado landmark that is already named for the cities we live in and a Spanish explorer. Find something new or something no one cares about and rename that if you must if just so that it would actually be an honor. There would be no honor for Mr. Reagan in naming the Coronado Bridge after him since no one would use the silly new name, it would go on being the Coronado Bridge in the public mind, and in the press, denying the honor those behind this effort crave for him. RE: The aside on the renaming of Jack Murphy Stadium to Qualcomm Stadium for $18 million. This “deal” is one of those rube arrangements from our past city council — the same geniuses who brought us the Charger ticket guarantee. They all but GAVE away the naming rights — no bids, and no analysis. To get some perspective on this, consider the deal recently announced by a PRIVATE stadium builder for the naming rights for the planned L.A. NFL stadium. Farmers Insurance has agreed to pay $700 million over 30 years for the naming rights. Sure– LA is a bigger market, and there’s been a modest amount of inflation since 1997 when the Qualcomm deal was hastily cobbled together. But this LA deal comes to an average ANNUAL payment by Farmers of $23.3333 million to the stadium owner — for thirty years! What a difference in makes when a deal is cut between two profit-seeking PRIVATE entities, vs. a government playing the game with OPM. We are consoled by the fact that at least it is still “Jack Murphy Field at Qualcomm Stadium”. Not.